Carpal tunnel syndrome is a painful condition affecting the hand and wrist caused by a pinched nerve in the wrist. What Is Carpal Tunnel Syndrome and Who Gets It? Carpal tunnel syndrome (CTS) occurs when the median nerve in the wrist is compressed by other structures in the "tunnel" formed by ligaments * and the carpal (or wrist) bones. The median nerve provides feeling to the palm, thumb, and middle fingers, and irritation of this nerve causes numbness, weakness, and pain. Hundreds of thousands of people in the United States have CTS. Many are people who use their hands and wrists too much (repetitive motion) or in ways that are not ergonomically * correct, but there are other causes too. CTS also affects some people who have synovitis * , arthritis, diabetes, obesity, or thyroid disease, and sometimes women who are pregnant or going through menopause * . * ligaments (LIG-a-ments) are bands of fibrous tissue that connect bones or cartilage, supporting and strengthening the joints. * ergonomics (er-go-NOM-iks) is a science that helps people to know the best postures and movements to use while working, in order to avoid injury and discomfort. * synovitis (sin-o-VY-tis) is inflammation of the membrane surrounding a joint. * menopause (MEN-o-pawz) is the end of menstruation. What Happens When People Have CTS? John's father loved coaching Little League, but after spending all week clicking away on his computer keyboard, his hands hurt too much to throw a baseball or grip a bat. John's father went to the doctor and complained of burning, tingling, and aching in his hands. He told the doctor that it hurt to cross his thumb over the palm of his hand and that the pain came and went but was worse at night. Anatomy of the wrist and palm. The doctor suspected CTS and did some tests on the median nerve in both wrists. The doctor diagnosed a mild case of CTS, and told John's father to wear splints on his wrists, to take aspirin, and to take lots of breaks during the day when working on the computer. John's father did some research about ergonomics and repetitive stress syndromes, and decided to reposition his computer keyboard. He lowered the keyboard so that his hands arched down at the wrist, and he stopped resting his wrists at the edge of his desk. John's father had only a mild case of CTS. In cases with more serious symptoms, the doctor may have to inject a medication called cortisone * into the wrists. 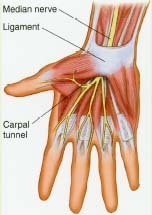 In severe cases of CTS, the doctor may recommend a surgical procedure, called carpal tunnel release, to relieve the pain. If left untreated, CTS can cause permanent nerve damage. With early treatment most people achieve pain relief and, like John's father, can return to coaching baseball and other active pursuits. * cortisone (KOR-ti-zone) is a medication used to relieve inflammation. The U.S. National Institute of Neurological Disorders and Stroke (NINDS) posts a fact sheet about CTS at its website. American Academy of Orthopaedic Surgeons, 6300 North River Road, Rosemont, IL 60018-4262. The AAOS is a physician group that posts a fact sheet about CTS at its website. Canadian Centre for Occupational Health and Safety, 250 Main Street, Hamilton, Ontario, Canada L8N 1H6.